Happy Interplanetary Be Who You Are Day! 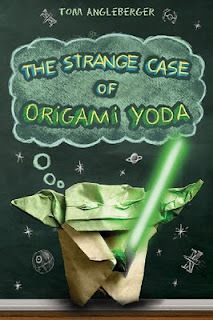 The Strange Case of Origami Yoda by Tom Angleberger! Huzzah! I liked it. My Review went up in November. Oh, just reading the review of it written by the round-2 judges. "We loved Benny’s growth as a person, though his deep hatred of Tom at the beginning seemed forced." Then later, "...and a strong sense of morality that adds depth to the story, only rarely feeling heavy-handed." Just seemed funny for them to be giving it an award while at the same time criticizing some things about it.